Based on the upsurge in reported cases, the Nigeria Centre for Disease Control (NCDC) declared a Lassa fever outbreak on January 22. According to the latest situation report released on the disease from NCDC on Friday, 731 suspected cases have been reported from 19 states. WHO said while these outbreaks are occurring during the Lassa fever season in countries where the disease is endemic, the speed of escalation is of concern. "The 275 confirmed cases to date, including 57 deaths, mark a significant increase - already a third of the total cases for all of last year, when Nigeria experienced its worst outbreak of Lassa fever," WHO said. "Nine health workers have been infected so far in this latest outbreak". Ibrahima Socé Fall, Regional Emergencies Director at WHO Regional Office for Africa, said WHO is concerned over the high number of cases so early in the Lassa fever season. The season is expected to last another four months. "WHO is working with the health authorities in the five-affected countries to ensure health workers have the capacity to detect cases and we are monitoring the regional spread of the disease," he said. WHO said it is scaling up its efforts to support the federal authorities, NCDC and the affected Nigerian states in responding to the outbreak. "An important focus is on early detection and confirmation of suspected cases, providing optimal supportive care and ensuring infection prevention and control measures in designated health care facilities in the affected states", the statement said. The global health agency also said it has intensified its technical assistance and is supporting coordination, enhanced surveillance, epidemiological analysis and risk communication. WHO is also mobilising experts to support case management and infection prevention and control. Whereas 12 cases have been confirmed to date in Benin, Guinea, Liberia and Togo, including two deaths, more suspected cases being investigated. WHO said it is assisting health authorities in these countries with contact tracing. It ia also providing medical and non-medical supplies and technical and financial resources as needed for case management, risk communication and logistics. 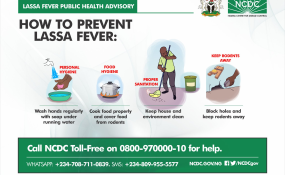 The international health agency said it has set up a regional coordination mechanism for countries to report any suspected case of Lassa fever "to expedite the flow of timely information and to assess the situation, recommend actions and help organize assistance. "WHO has also reached out to the six other at-risk countries - Burkina Faso, Cameroon, Ghana, Mali, Niger and Sierra Leone - and is supporting prevention and readiness activities as needed," it said. Mr Fall said: "WHO continues to advise all countries in the Lassa fever belt to enhance their preparedness and response capacities, especially for early case detection, laboratory confirmation, case management under recommended barrier nursing, risk communication and community engagement." More than 80 per cent of Lassa fever cases are rodent-to-human transmission. Person-to-person transmission occurs in both community and health-care settings. Prevention of Lassa fever relies on promoting good "community hygiene" to discourage rodents from entering homes by storing grain and other foodstuffs in rodent-proof containers, disposing of garbage far from the home, maintaining clean households, keeping cats and the safe handling of anyone who may have died of the disease. In health-care settings, health-care workers should always apply standard infection prevention and control precautions when caring for patients. Lassa fever is also treatable if presented and diagnosed early.